I had a lovely stay, very clean. Friendly staff. When would you like to stay at YHA Brighton? YHA Brighton, in all its magnificent Regency grandeur, is on the doorstep of all of Brighton’s best attractions. You will find us just a short stroll from the world famous Brighton Pier, the Prince Regent’s magnificent Pavilion and the Lanes shopping area. Brighton is famous for its liberal values and forward thinking attitude and you'll find a city with an abundance of independent boutiques, quirky pubs and alternative cafés. The city is also known for its nightlife and YHA Brighton is ideally positioned to enjoy clubs and bars in the area. First Floor: one 8-bedded room with bunks, five 6-bedded rooms with bunks, five 4-bedded rooms with bunks, one 3-bedded room with a single bunk over a double, three double rooms with double beds, one single en-suite room, one accessible room with a single bed and a double bed with a single bunk above. Second Floor: five 6-bedded rooms with bunks, one 5-bedded room with a single bunk over a double bed and two single bunks, seven 4-bedded rooms with bunks, one double room with double bed, one twin room with bunks. Third Floor: 16 double rooms with double beds, one twin room with 2 single beds. Our double rooms include double beds instead of bunks, a TV, soap, towels, two pillows per person, storage space, dressing table and chair. Some rooms even have a roll-top bath and a sea view - we know you're not going to be in your room too much in the vibrant city of Brighton, but why not enjoy it while you are? This is hostelling like you've never known before! YHA Brighton offers a café and bar, self-catering kitchen, bike store and meeting room. There is also a luggage store (small charge is applicable) and an ironing room. Brighton is a vibrant city that likes to party and we're located right in the centre of the action! Aside from the three major festivals - Brighton Fringe, Brighton Festival and Brighton Pride, there is a year round programme of entertainment from alternative comedy through camp cabaret to contemporary art. The city is renowned for its nightlife and when staying at YHA Brighton, you’re ideally positioned to enjoy the best clubs and bars in the area. With plenty of options just a very short walk away from the hostel, it’s perfect for those wishing to be in the thick of the action. And, if you need a stylish base for a trip to London, Brighton is fab for groups and just a quick and easy drive down the motorway from the capital! If a quiet night is important to you, you may want to consider staying at YHA South Downs (just 20 minutes by train). The Brighton Grind Café & Bar provides a great place to meet fellow travellers, share stories and chat about your plans if you need any ideas for what to do in this vibrant city. YHA Brighton offers a broad selection of delicious food alongside a range of freshly made hot drinks and a well-stocked bar. Open daily to guests and passers-by, let us welcome you to rest your legs and indulge your senses after the day’s sightseeing. 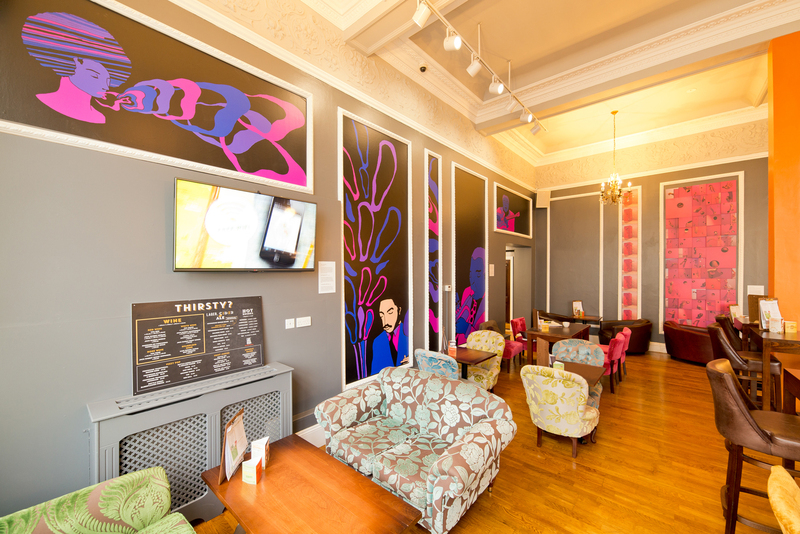 Choose from our tasty daily specials or delve into our café-bar style menu experience, think scrumptious bar snacks, light bites, stone-baked pizzas and piled-high burgers. Don't forget, kids under 10 eat free – get one kid’s meal free with every adult’s meal. Soak up the history and culture of this vibrant city by pedalling between Brighton's iconic landmarks. We now sell tours at reception for groups of two or more people. Suitable for ages 13 and up. Packed full of video games, thrill rides and shops - if you're looking for the very best of English seaside entertainment, you'll find it here! A true shopper's paradise jam packed with independent shops and boutiques, this maze of twisting alleyways, twittens and catcreeps has everything you need for unique gifts and fashion. This extraordinary building was designed for George IV and has an unforgettable style of architecture! Set at the heart of Brighton's cultural quarter (in the garden of the Royal Pavilion!) this museum and gallery is home to a huge collection of amazing objects. Once a slum area, now Brighton's hippest bohemian and cultural quarter - don't miss out on over 400 indie shops, cafes and vibrant entertainment venues! Revisit your childhood at one of the finest toy museums in the world! Families and the young at heart will gaze in wonder at over 10,000 toys and models. The world's oldest operating aquarium is right on the sea-front! Want a REALLY good time? Head to one of the best comedy, cabaret and music venues in the south! Join Julian for his unique take on the "Brighton Story" with a guided tour around the historic town. The South Downs National Park is on the doorstep of Brighton, so why not leave the city behind and get back to nature in the beautiful countryside? Wild Park is situated just to the north east of Brighton city centre and is home to a selection of short, well crafted trails for both downhill riders and freeriders. Cycling is the best way to see the city of Brighton as it has been selected as one of the UK's Cycling Towns. Powerboat rides, dinghy sailing, yacht sailing and powerboat training are all available at the Brighton Marina Watersports Sea Sailing School, located just east of Brighton city centre. If there is one thing Brighton is famous for, then it’s its proud heritage as a city of diversity, particularly diversity of sexuality. If you’re interested in YHA’s work as a charity dedicated to transforming young lives, and would like to know more about ways to get involved and support us, these events could be just the ticket. Towels and toiletries: Towels and toiletries are not provided but are available to hire or buy from reception. Bedding is supplied. Parking: There is no car parking at YHA Brighton. The nearest all-day multi-storey is The Lanes car park which is directed to from the sea front. There is an unloading bay outside the hostel for drop-offs. Pets: Pets permitted only in public areas at YHA Brighton. Assistance dogs are welcome. Wi-Fi: Free wi-fi is available in social spaces and bedrooms. YHA Brighton is ideal for school groups wishing to combine their trip with a visit to the popular capital city. With 151 beds, the hostel has plenty of space for your school group to enjoy. All rooms are en-suite and we have many comfortable rooms suitable for teachers. Visit the YHA School Trips website to book your stay. At YHA Brighton we have two meeting rooms available for hire - the Meeting Room and the Dining Room. Capacity Up to 65 delegates in the Dining Room and up to 32 delegates in the Meeting room, depending on seating configuration. Parking: There is no car parking at the hostel but there is a loading bay outside for drop-offs. The nearest all-day multi story is The Lanes car park which is signposted from the sea front. Accessibility: Both meeting rooms are on the ground floor. The Dining Room is wheelchair accessible but the Meeting Room doorway is too narrow for wheelchair access. Brighthelmston gained its town charter in 1313 allowing it a weekly market, and so the shopping began! The street plan of The Lanes is that of medieval Brighton, and locally the small alleyways are known as “twittens” and “catcreeps”. Initially, goods were all fish-related, however, these days there is much more variety, ranging from chocolate unicorns to vegetarian shoes. In 1783 the Prince of Wales visited Brighton and was the first to recognise its ‘coolness’. His Royal Pavilion grew from farmhouse to palace in stages between 1787 and 1823, during which time he became Regent and then King George IV. The arrival of royalty and associated hangers-on, changed Brighton’s fortune, and provided many local people with otherwise scarce work. Many of the grand squares seen in Brighton today were started during the Regency period. During the 1800s the health benefits of the seaside were marketed as alternatives to the waters of the spa towns. Initially, this was a trend for the wealthy, but by the end of the 19th century the success of the Industrial Revolution and the expansion of the railways meant that people of all classes could escape the city smog, and towns like Brighton thrived. Many of Brighton’s grand hotels were built in the 19th century to accommodate this influx of visitors, the Royal York being one of them. Originally built as a manor house in 1771, the Royal York was named after the Duke of York, cousin of the Prince Regent. The site was developed into a distinguished hotel in 1819, attracting guests such as Benjamin Disraeli, William Makepeace Thackeray and even Charles Dickens, who did a reading of David Copperfield there in 1860. Falling into disrepair in the early 20th century, the refurbishment was handled by Harry Preston, later knighted for his services to charities around Brighton, making YHA’s presence in the building all the more fitting. In 1908 the cost of a double room was 80p and breakfast was 18p; not even YHA can beat that! The Royal York had a less thrilling 20th century, much of which was spent as an office building until 2006 when it reverted to a hotel. As of November 2014, The Royal York Hotel was transformed once again, this time to the incredible YHA Brighton. With the generous support of The Coastal Communities Fund, the building was refurbished creating a stylish, modern Youth Hostel whilst maintaining many of its original features and charm. YHA Brighton is a stylish, eclectic social hostel, reflective of the area. Des Byrth has been the Hostel manager at YHA Brighton since Novemeber 2016 after some 27 years working in the Hospitality Industry. Des has built up a wide and diverse experience within the service Industry managaing hotels, restaurants and bars and is a experiencedl traveler and hiker. Des has lived in Brighton for 20 years, and has a stronf knowledge of the local area should you need any tips on what to explore.